Do you want your dinner guests to be impressed with your culinary skills? Try a recipe using Basmati rice. If you want your dinner guests to be impressed with your culinary skills, try a recipe using Basmati rice. 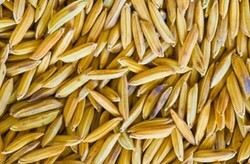 Meaning “the fragrant one” in Sanskrit, this long grain rice is often featured in Middle Eastern cuisine. Grown and harvested in paddies in India, Bangladesh and Pakistan, the grains of the brown and white versions are considered soft but not sticky. After cooking, the grain stays separate and fluffs out easily with a fork. The popular rice is known for its nutty taste and unique aroma. Due to its distinctive flavor, Basmati stands alone as a side dish. It is also used in many traditional Indian dishes. Pulao, sambar and curry are three great ways to use Basmati to capture the blend of Indian culture and cuisine. Prior to its use in India, pulao was a Persian dish known as pillau in Iran. In Armenia, the dish was called pilaf or pilav, while versions were called pilafi in Greece or paellas in Spain. In the United States, this rice dish is titled pilaf. Used mostly as a side dish for special occasions , rice pulao is a flavorful healthy dish. Variations include adding vegetables or chicken. Jeera Matar is a popular pulao dish using cumin and peas. Cardamom, ghee and turmeric are commonly found in pulao. A comfort food served on a regular basis in the southern regions of India, sambar consists of mashed lentils, tomatoes and spices. It’s basically a type of lentil soup with a kick. Although there are many variations of sambar, they all include many of the same spices. If you want your recipe to turn out tasting like traditional sambar, you need to know a few tips about key spices. One of the universal ingredients in sumbar is curry leaves. You can find curry leaves in specialty stores featuring Middle Eastern foods. Grown in tropical climates, curry leaves add a distinct element to the flavor of sumbar. If you cannot find curry leaves, do not try to substitute another ingredient. Sambar powder is essential is all sambar recipes. You can buy pre-made sambar powder or make it yourself. If you decide to make your own powder, grind the ingredients and store in a sealed container in a dry place. Adjust tamarind amount to taste. It should make the sambar tangy but not overly sour. Found in South India, tamarind gives the sour taste to Indian dishes like sambar. Usually found as tamarind seeds pressed together during packaging, you can occasionally find it in specialty shops in different forms. When you are ready to cook with tamarind, break off an appropriate amount and soak it in water for about two hours. After soaking, squeeze the juice from the tamarind into your bowl and throw away the seeds and solids. A simple way to prepare this dish begins with a bowl of Basmati covered with sambar. Depending on your taste, top it off with a dollop of yogurt or some buttermilk. With a stew-like consistency, this easy recipe tastes nutty with a chewy texture. Other variations of sambar include adding cauliflower, carrots, eggplant or bell peppers. If you want to try veggies more authentic to the nature of the dish try drumsticks. A tubular green vegetable, drumsticks usually are available canned. Another idea to add a sweet taste and aroma is daikon. It resembles a large parsnip or white carrot. Basic curried Basmati is the foundation for diverse recipes using vegetables, chicken or other ingredients. Curried Basmati requires curry powder, cumin, nutmeg, cardamom, tamari and lemon juice. It is typically bowled in water with olive oil. Cilantro, scallions, tomatoes or balsamic vinegar are a few common additions to curried rice. If you are looking for a rice to use every day or for special occasions, Basmati rice provides plenty of flavor and versatility. In addition to palau, sambar and curry, there are numerous ways to use the healthy grain. I have never had this, but I can't wait to give it a try.